Several countries have adopted the new GST taxation system; which in full refers to Goods and Service Tax. France was the first country to adopt this tax regime, today over 160 countries use it including India. VAT, which refers to Value Added Tax has been in existence for a while now, and is adopted by more countries globally. Both VAT and GST tax regimes are levied on values of sale or goods supply. There are however several differences between the two, read on to find out what differentiates one from the other. Value Added Tax is the charge levied by the government of a particular country, on each production or distribution stage of goods. This tax system is charged within multiple points. 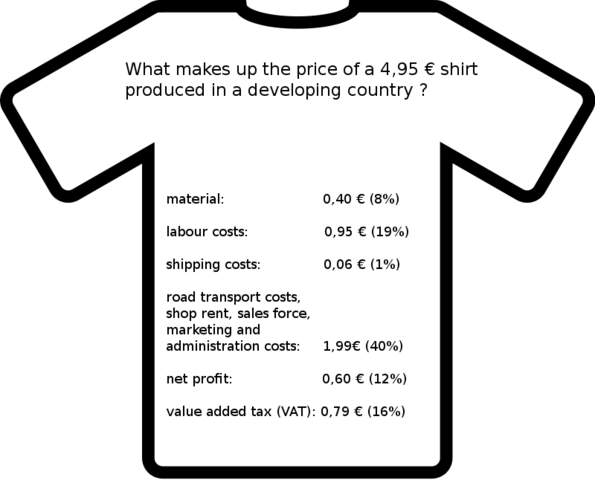 It is a consumption tax form, where the total value addition a firm creates equals the difference between the proceeds and the total spent on purchases. The value added tax enables the buyer of the commodities to avail the input tax credits, this is the tax amount paid previously will be reduced from the net tax liability. In order to avail input tax credit within the VAT system, registration must be obtained. In the VAT system, the taxes are levied using different rates, the more commonly used is 0% for agricultural goods, 1% for precious jewelry made of silver or gold, 4% on raw materials and 20% for luxurious items. 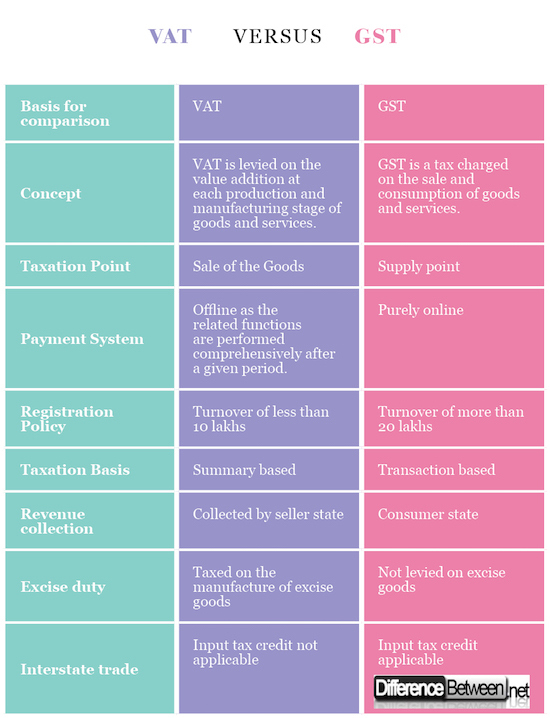 Goods and Services tax is quite similar to VAT. It is a destination based value addition tax levied on production process, sales and the final consumption of the goods and services. The GST eliminates the cascading effect as it only applies to the value addition within every stage, where no other taxes will be applied. Cascading effect refers to the double payment of tax, where previous tax payments on a particular good or service is not accounted for. This GST system enables suppliers to have the tax charges reduced where the GST paid on the purchase process will be offset against the GST payable in the supply of the merchandise or services. The final consumer will incur all the tax charges imposed by the final supplier within the chain of distribution. Some countries such as India have Dual GST regime where taxes are levied simultaneously by the government of taxable goods and services. Value Added Tax is a direct tax where the charges are levied from the state level, within every production and distribution level of commodities and services. There is an additional credit applicable from tax paid previously. Goods and Services Tax on the other hand, is a singular tax charged on the supply of commodities and services which relies mostly on the value addition concept. VAT is charged at the sale point, GST is levied at the point of goods and services supply. Value Added Taxation is performed offline, whereas Goods and Services Tax is performed purely online. 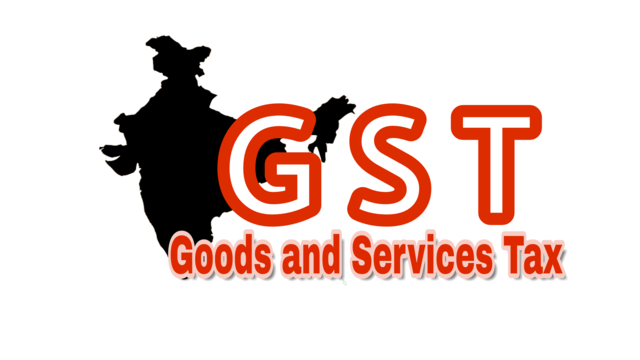 The registration, returns filing and all other related functions are fulfilled via a GST portal which is controlled and managed by a Goods and Services Network. The turnover determines which tax regime a supplier will fall into. For example, in India, suppliers with a turnover above Rs. 10 lakhs is susceptible to register under the VAT. Turnovers above 20 lakhs require the acquisition of registration under the GST. GST is a transaction based tax system, whereas VAT is a summary based system. The latter requires the seller to submit returns at the end of a particular period. In the VAT system the seller is responsible for the collection of revenues, whereas in the GST the revenue collection is performed by consumers. Double taxation is present in the Value Addition Tax regime, where the manufacturer pays tax on the excisable goods during production and VAT on sales made. The excise duty within the Goods and Services Tax is subsumed up, double taxation is not possible on such goods. VAT system does not allow for the input tax credit during interstate sales. A good example is where a manufacturer for shoes pays excise duty and an additional VAT on the sale of the shoes within another state. Despite both the taxes being value addition taxes, tax credit is not applicable as they are levied by different bodies, the central and state governments. GST is based on the principle of ‘one nation one single tax”, so the tax credit will be available during interstate trade. Both GST and VAT serve the same purpose of tax acquisition from the manufacturing and distribution processes of goods and services. Over 160 countries have recently adopted the GST over the VAT tax regime. VAT is charged within different stages of manufacturing and distribution, at the point of exchange or sale. GST is charged on the supply stage of goods and services, hence, removing the cascading effect. Evah Kungu. "Difference Between VAT and GST." DifferenceBetween.net. April 16, 2018 < http://www.differencebetween.net/business/difference-between-vat-and-gst/ >. Pfeiffer, Sebastian, and Marlies Ursprung-Steindl. Global Trends in VAT/GST and Direct Taxation: Schriftenreihe IStR Band 93. Linde Verlag GmbH, 2015. Lang, Michael, and Ine Lejeune. Improving VAT/GST: Designing a Simple and Fraud-Proof Tax System. IBFD, 2014. OECD. Consumption Tax Trends 2016 VAT/GST and Excise Rates, Trends and Policy Issues: VAT/GST and Excise Rates, Trends and Policy Issues. OECD Publishing, 2016.